Originally from Germany, saxophonist Ingrid Laubrock was active in London for more than a decade before moving to Brooklyn in 2009. She actively leads two groups: Sleepthief, which includes British pianist Liam Noble and New York’s Tom Rainey (drums), and Anti-House which is made-up of Brooklyn-based musicians Mary Halvorson (guitar), Kris Davis (piano), John Hebert (bass), and Rainey. Together with Davis and Tyshawn Sorey, she is part of the collaborative trio Paradoxical Frog. 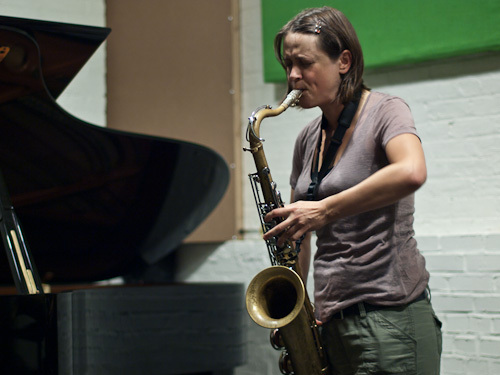 Laubrock has also been active as a sideperson on the New York scene, playing in the Tom Rainey Trio, Mary Halvorson Septet, Kris Davis Quintet, Catatumbo, Haste, and Luc Ex Sol 6 and Sol 12. In addition, she has performed and recorded with: Anthony Braxton, Dave Douglas, Kenny Wheeler, Tim Berne, Mark Helias, Michael Formanek, Evan Parker, Steve Beresford, John Edwards, Veryan Weston, Luc Ex, Django Bates’ Human Chain, and The Continuum Ensemble, among others. As part of the F-ire Collective, Laubrock won the BBC Jazz Award for Innovation in 2004,was nominated for the BBC Jazz Award for “Rising Star” in 2005, and won a Fellowship in Jazz Composition by the Arts Foundation in 2006. She won the 2009 SWR German Radio Jazz Prize and was one of the finalists for the 2009 Westfalen Jazz Preis. In 2011 Ingrid was commissioned to compose, rehearse and record for the prestigious New-Jazz Meeting, an annual production by the SWR. Her chosen octet featured Drew Gress, Halvorson, Rainey, Ted Reichman, Noble, Tom Arthurs, Ben Davis, a recording which was released on Intakt Records in 2012.